Becoming an effective and beloved leader is cultivated through self study, training and experience. Leadership skills are demonstrated through the progress of the employees they lead, innovation and exceeding organization goals. 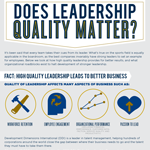 In this infographic from the University of Notre Dame explains the contributing factors and concerns for quality leadership. Astounding Gig World Records Revealed by StubHub UK!You’ve still got time… to shop online… for your Valentine! !